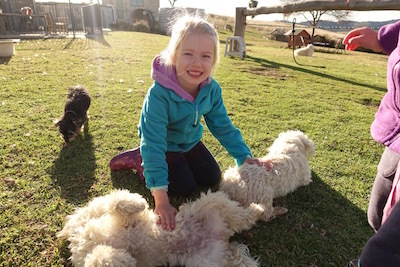 Led horse rides, feeding our many farm animals, baking homemade afternoon tea and Kid’s Club are just some of our numerous complimentary and fun activities for the whole family that you will love while staying with us at Ba Mack Farmstay. From the very moment you arrive you will feel very much a part of our family and farm life with my homemade afternoon tea and a welcome committee of an array of animals to personally greet you. My daughter and I are here for you during your entire stay. With a maximum of only two families staying with us at any one time, you can be assured of receiving lots of “one on one time” with us. People often ask us what our favourite animal is – and wow that is so hard to answer … when you come and stay with us and see all our animals you will understand why. I wonder what your favourite animal will be? Every morning, after enjoying a generous full country breakfast with my own freshly baked bread; you are invited to help us feed all our many animals. We can’t wait to share so many stories and information about animals and country life with you. 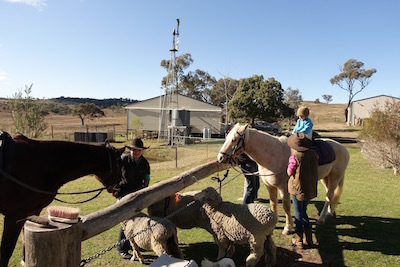 Each day after the morning feeding, your family will be given the opportunity to experience lots of “horsey” time, with basic instructions on how to handle, groom, saddle and ride a horse (on a lead). Then you are welcome to enjoy up to an hour horse ride (on a lead) around our farm. Due to insurance, all our lessons and rides must be on lead, however, we can show you lots of things that you may not have ever had the opportunity to do before and we enjoy sharing this wonderful experience with you. Mmmmmm who remembers homemade freshly made scones with whipped cream and jam, chocolate chip cookies, ice-cream etc? Well, your in for a real treat because children (and adults) are welcome to help me bake something yummy every afternoon in the homestead kitchen and enjoy afterwards. If you have a favourite afternoon tea, be sure to let me know and I will be happy to bake for you.